Beauty is one of our prime pursuits as we go about our daily lives. The society we live in places a lot of emphasis on our looks. How we look greatly determines how the society around us will consider us. We subconsciously draw conclusions about individuals within the first one minute, often before anything has been said. Within this one minute, you will have decided whether the person is nice, has money, his social status, whether you may like him; among numerous other things. We can therefore not afford to neglect our looks. An important tool to enhancing our beauty is makeup. Makeup will enhance our strengths and will also cover those embarrassing blemishes we don't want seen in public. However, incorrectly applied make up can lead to embarrassment. It is therefore wise to learn the correct way of applying makeup. The following beauty tips explain the process of applying the foundation and concealer. Beauty tip number one is that when you decide to apply makeup, you must first carry out a thorough analysis of your skin to determine whether you have oily skin, dry skin or normal skin. Examination of the skin will also determine the skin tone, eye color and other parameters relevant in the choice of cosmetics. A makeup artist at your cosmetic store should be able to assist you in assessing your skin so that you may select suitable products for your skin, from among the many cosmetics available. Armed with the right products, you will now be ready to advance to the next step, which is the actual application of makeup. Beauty tip number two is that before you apply any makeup, you must first wash your face and your hands. This gets rid of dirt and bacteria which may have accumulated on the skin. You can then apply a thin layer of moisturizer and allow it to soak into the skin for a while. The moisturizer will help make your face smoother. Afterwards, rinse in warm water and pat the face dry with a towel. Make sure your towel is always clean. A dirty towel is likely to spread bacteria on your skin leading to skin problems like pimples, especially if you have an oily skin. If you wish, you may apply a primer; this improves the texture of the skin making the foundation last longer. They are available in most cosmetic shops. The next stage is to apply the foundation. You must select a foundation which matches your skin color. When you blend the foundation, it should melt into the natural skin color without leaving any noticeable trace. 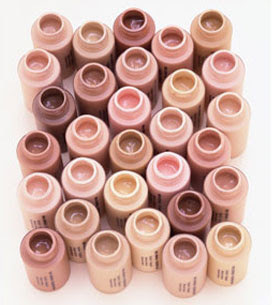 Most foundations have orange or pink based colors. However, a yellow based foundation has been proved to be most appropriate for all skin colors. Test the foundation on the jaw line or on the fore head to ensure that it matches the skin. The foundation should then be applied on the face using a brush with light downward strokes. The finger tips or a sponge are equally efficient, especially when you want some concentrated attention on a particular spot. Concealers come in different shades. Some have shades which match the color of the skin while others have sharply contrasting colors meant to camouflage particular blemishes. 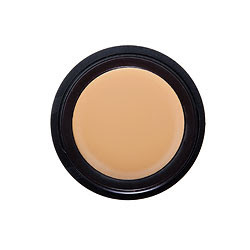 A light colored or white concealer may be used to cover dark spots, while dark colored concealer may be used on a lighter skin patch. Selecting the right concealer can be quite a dilemma. Which shade is the best to go for? For most women (and men), yellow based concealers, like yellow based foundations, are the most suitable. You must however decide what it is that you want to use the concealer for. Because of the sheer difficulty of ascertaining the right shade, you need to seek the assistance of the make up artist at the cosmetic shop. You must try out the concealer to ensure it is just right before you purchase it. Concealers are packaged in different forms. They may be liquid, semi solid, pencil or felt tip. Which ever the choice you make, the concealer should be applied carefully in thin layers, which can then be built upon until the blemish is fully concealed. When using both a concealer and a foundation; which should come first? This question is quite tricky. When you apply the foundation first, you will realize you may not need much concealer. On the other hand, if you apply your concealer first, you may not need as much foundation. Also since some concealers contrast sharply with the skin color, they must be applied before the foundation. All in all, it is up to you to decide what works best for you. A concealer and foundation are very important items on your dressing table. They play a very important role in enhancing beauty. They strengthen appeal and also disguise those blemishes which otherwise ruin the flawlessness of your complexion. Remember that beauty is mostly perceived with the eyes. The skin is the first part of your body that anyone looking at you sees. You must therefore ensure that you pay attention to it. The foundation and the concealer are the foundation to your beauty. Learn to use them.